Jane Austen Today: The Austen Shopaholic: Great Deals on Mr. Darcy! The Austen Shopaholic: Great Deals on Mr. Darcy! 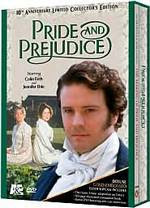 The A&E Shop online is offering the 1995 BBC/A&E mini-series of Pride and Prejudice DVD set at 60% off retail price at an incredible value of $15.98 until September 17th! This two DVD set includes 300 minutes of Jane Austen's classic novel adapted by Andrew Davies and staring Colin Firth as Mr. Darcy and Jennifer Ehle as Elizabeth Bennet. Don't miss out on your chance to own what is unarguably the ultimate movie adaptation of the greatest love story ever written or filmed! Here are some great bargain books at $5.99 or less to fill out your Austen inspired library. Happy viewing and reading to all! I can attest that the anniversary set of 2005's Pride and Prejudice is a sweet deal. I purchased it for $20 and felt that it was a bargain at that price! The accompanying book is full of interesting information that I had not known about the series before. I cannot recommend it highly enough.